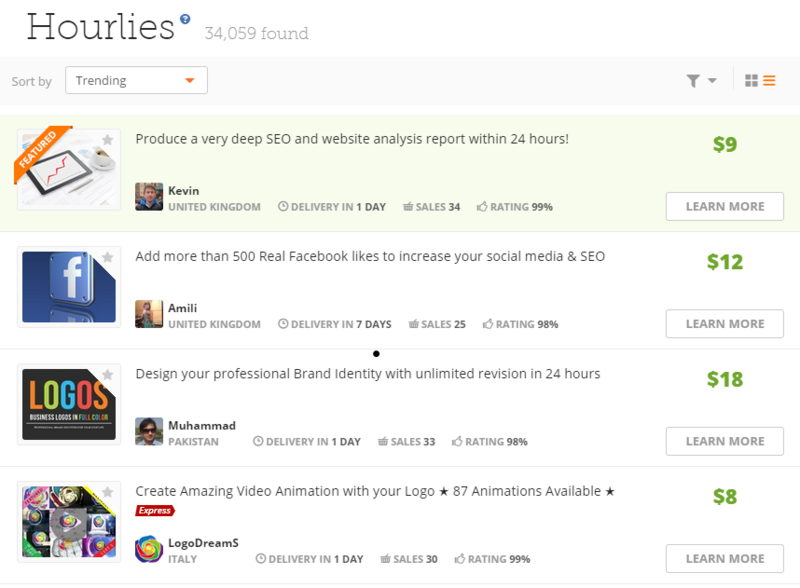 You are here: Home / Reviews / Can You Find Good Talent on PeoplePerHour? Years ago, I used Guru.com to find someone to fully index one of my books. The gal did a terrific job, and I reached out to her several times after. I’d also found a good image “slicer” for converting Photoshop templates into HTML. The rest of the folks I hired? Meh. But that was expected on a site that doesn’t actually verify the talent of its members. Last year I created an account at PeoplePerHour to offer my services. The site claims to connect talented folk with those needing specific work done. Business owners can post jobs and receive bids, or they can browse flat rate service offerings (PPH calls them Hourlies) and pay for a specific task to be completed. 1. It’s quite difficult for people with real talent to get any serious work. Even with a stellar portfolio, they’re competing against people willing to work for peanuts. On many bids I cut my rate in half, and still couldn’t get a bite. I was competing with people willing to build complete websites for less than $300, and ecommerce sites for $500 or less. 2. Many hourlies are cheap, and won’t provide the bulk of what you need. 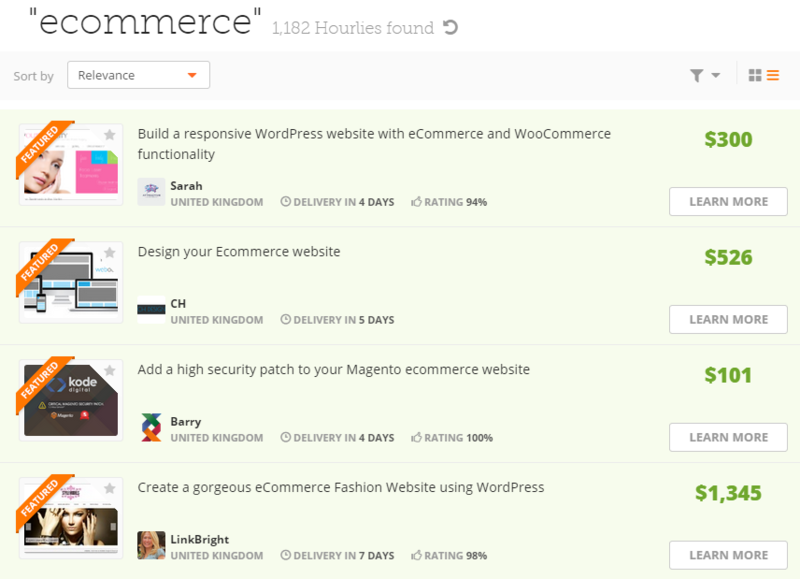 On April 24, 2015, the featured jobs for “ecommerce” caps at less than $1,400. It’s possible the result would be a nice, easy to navigate site. Chances are, though, the template used has been used many times over, and from the posting it doesn’t include a plethora of key features ecommerce sites likely need. Because the design of an ecommerce site is more than just “looks”, getting everything you need for under $1,400 ? Doubtful. You’ll find tens of thousands of online services, too. Sort by price and you’ll be amazed at what you can get for less than lunch at Chili’s. 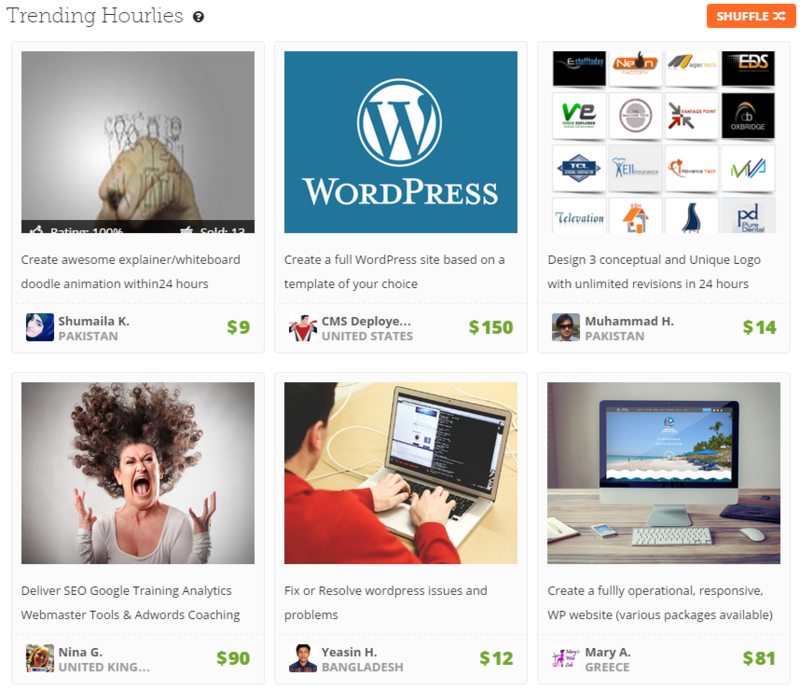 Browse the latest hourlies and you can find “deep SEO and website analysis” for $9, logos with unlimited revisions for $18 and video animation for as low as $8. 3. Questionable / unethical services are fine, even ones that can get you sued. There are hordes of contractors that will write fake reviews for your business, and PeoplePerHour must be okay with this, because these types of hourlies have been running for more than a year. I wrote about the Yelp posts last year, and explained how paying for fake reviews can cost you a ton. Most recently, Amazon started cracking down on fake review sites. 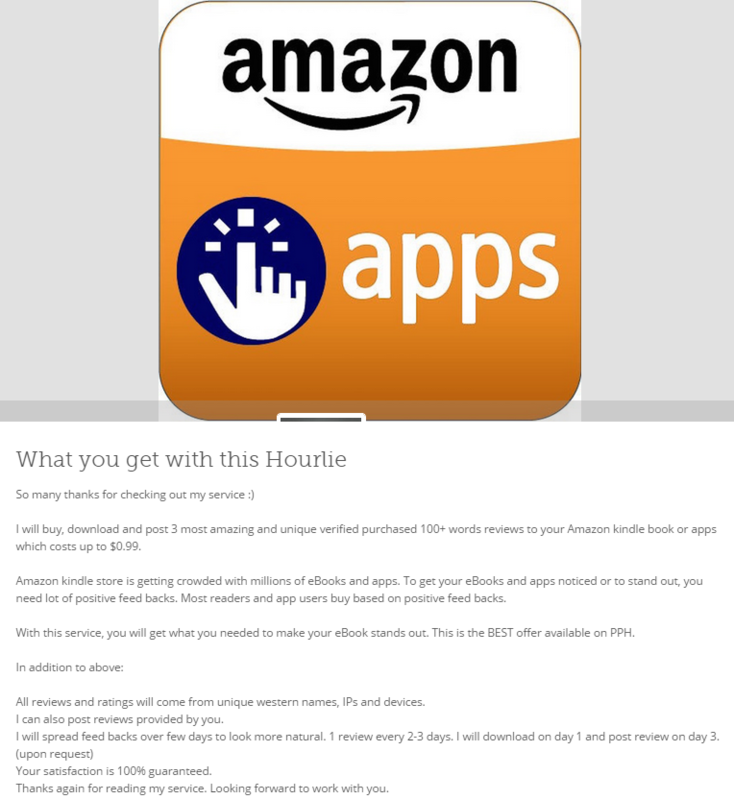 Screenshot of a PPH hourlie. Note the bottom where the contractor says he’ll even post your own review under a different profile. 4. Actions that violate social media network terms? Yep, you can get those, too. 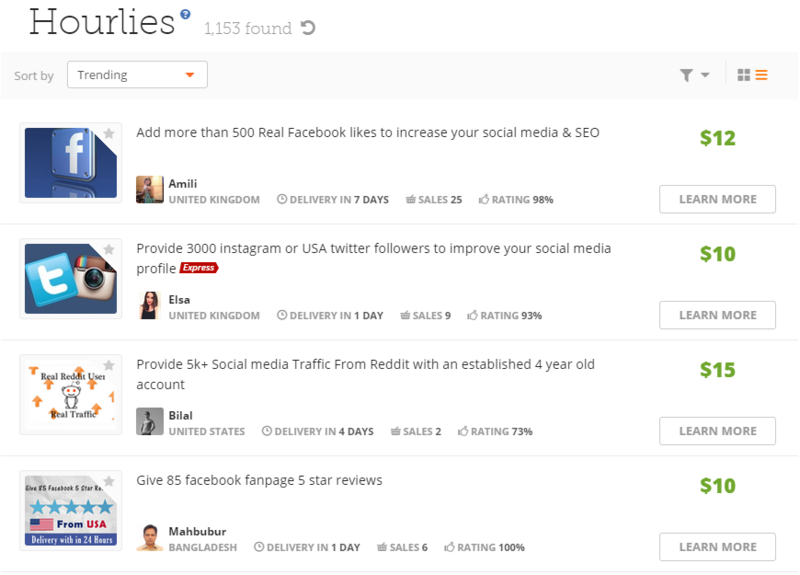 I found thousands of services that will give me a big boost in Facebook fans, Twitter followers, network profile ratings and more. While PPH wouldn’t likely be held liable for a business’ purchase of such services, it goes to show that this company is more interested in volume than quality. Services that violate social networks’ TOS are fine to sell and buy on PPH. This process actually puts unsuspecting business owners at risk. It puts the contractors at risk, too. 5. According to its own blog, the company supports working for peanuts in order to prove your worth. Let’s be honest. Clients hire me because of my experience, ongoing training and efforts to know their business before taking action. None of this came cheap. PPH’s model tells us that two types of contractors are the most successful using its service: 1) the ones who don’t have a great deal of experience and training; and 2) the ones who have experience but are willing to be taken advantage of. The “crucial” tip: Sell yourself short to get noticed. I get why many small- and micro-business owners use service sites like this. Unfortunately, education about them is vital to your success. There is good reason why you want to pay developers and consultants more money. In the long run, it’s going to save you money and a great deal of headache. There’s nothing like waking up one day to find your fan base and business ranks have plummeted. And, more likely than not, there won’t be a thing you can do about it. Disclaimer: There definitely are some talented and ethical contractors on this site. Unfortunately, the bulk of them get little or no work due to questionable competition. As always, I advise researching contractors across many channels before taking the plunge.